We're not satisfied with simply selling you a car, truck, or van; we want to take care of all your automotive needs so well that you'll come back again and again. We hope the experience will have you so pleased that you'll tell your family and friends about us, too! Our team is committed to staying focused on your needs as a customer. When you visit our facility, we want you to feel at home. We also believe in rewarding your customer loyalty with significant frequent buyer incentives and added values. Our goal is to be your dealer throughout your life by being the "World's Best Car and Truck Dealer." We know that the key to reaching our goal depends on the treatment you receive. We will not lose sight of this fact. Remember, our #1 goal is for our customers is to "Drive Easy." 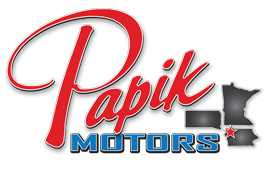 Thanks for considering Papik Motors!